The key to employee loyalty is recognition. Long service awards are aimed at reinforcing best behaviours and highlighting achievements, along with employee appreciation for their efforts. The practice of rewarding employees for their long-term contribution to the company is an old one. Not just that - it was meant as a celebration of the company's success at retaining employees for a longer period of time, therefore contributing to its reputation as a 'good place' to work in. However, companies no longer wait for 25-30 years to elapse before considering an employee for a long service award. No longer do employees receive clocks and scarves as tokens for their commitment to the company's goals. The awards have changed to accommodate significant changes in the way people work and the length of an employee's service with a single employer. So, How Have Long Service Awards Changed? The emphasis of Long Service Awards or Recognition Awards is no longer on rewarding employees who have stuck around in the company for decades without growing much in the organisation. Given how the current 'millennial' workforce loves to jump across companies and profiles on the lookout for better pay and favourable work culture, it has become important for a company to recognize as little as 3 months of service and motivate employees to stay and perform. Employees strongly feel their company cares about them & they belong to it, if an effective, long service awards program is in place. Longer retention of employees than in companies without a milestone program. Employees prefer long service awards over performance awards as a measure of how much their company cares about them. Employees believe long service awards to be fairer than performance awards. The practice of giving long service awards and employee recognition trophies is not just about recognition - it's a whole lot more than that! Long Service Awards also known as Employee Recognition Awards are a great way of saying 'Thank You' to employees committed to the company's culture, goals and growth. A motivated employee strives to achieve maximum productivity, even under pressure. Long Service Awards are a reward for this conviction, and motivate them to surpass their own achievements. Behind every satisfed customer, there's an engaged, motivated and loyal employee. And a satisfied employee is one who's efforts don't go unrecognised. The secret to retaining talent is recognising it, and ensuring it has sufficient opportunities to grow. Organisations that appreciate value and loyalty can express it through long service awards. Long Service Awards signify an organisation's willingness to recognise an individual and their contribution to the business, and to demonstrate to their peers that the organisation values people who are committed to the business, who live the values of the business, and add value to the business. A letter of thanks can be really personal and packed with achievements spread over an employee's career, recent highlights or personal anecdotes. The key is a manager or the team members writing it especially for the individual, to really underline the significance of the award and how the milestone has been reached. While this depends on the company's policies, who doesn't love an extra few days to spend with their family, go on holiday or relax during the holidays? You could award a certain number of hours or days off for a period of long service, and increase it over time. It might be a meeting, an email, a feature in a company newsletter or an announcement on an enterprise social network, but announcing a long service achievement to teams and departments across the organisation is one of the best ways to share the celebration - prompting others to share messages of congratulations. Long-service awards conjure up images of employer-branded scarves or memorabilia such as pens. A plaque is another sign of recognition that employers like to use. Choose uniquely designed plaques that reflect the company brand and culture, along with signifying the nature of the employee's achievements. Many employers offer gift cards or vouchers to long-serving employees. These can have a value to reflect an employee’s length of service. Gift cards offer employees the flexibility to choose their reward. Employers can also personalise a gift card with the employee’s name and the organisation’s brand. These can be given out at an awarding ceremony, along with a plaque or memento designed in tune with the company brand and the employee's achievement. Who doesn't love a little time away? A travel gift is a significant gesture and one that celebrates a long term contribution. Employees can redeem a voucher for an overnight stay, a weekend away or even a package family holiday; much of the pleasure in a great reward is in the ability to share it with loved ones. Like with a travel gift, Experiences come with the added value of 'shareability' - award a gift that can be redeemed for an experience on an individual basis, with a friend or partner, for a family day out or even shared between teams of colleagues to reinforce long and loyal service as a benefit to everyone. Source a gift with the employee's name, or go a little further and add the date of their long service anniversary. 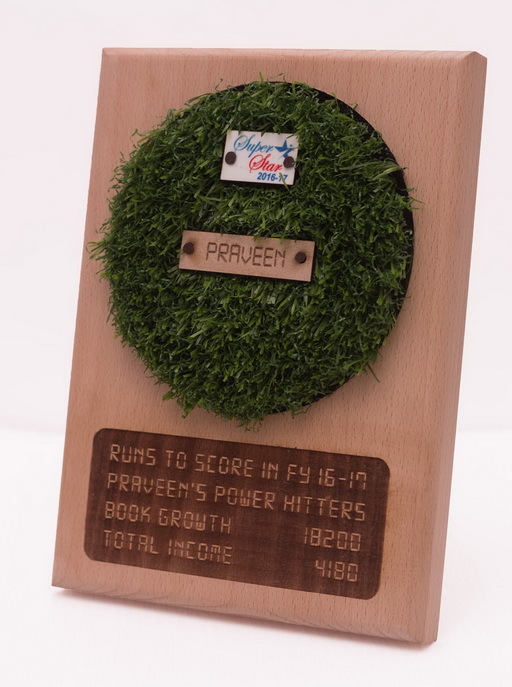 It could be anything from the traditional trophy or plaque to a book with their 'company history,' with anecdotes from colleagues and teammates to create a fun, meaningful keepsake. Don't forget to ask workmates what the ideal gift might be. We all know that one size rarely fits all - so why not invest a little extra time and effort to find the right gloves for a passionate biker or a first edition for a bookworm? A luxury gift is a popular way to show appreciation for employees who have stayed the distance - contemporary choices include a premium watch, designer jewellery, cufflinks or card case. Engrave it with the employee's name to make it more personal. Surprise them with a big TV, an iPad, garden furniture... Choose an item that will get used a lot, and it's sure to evoke a positive feeling for a long time into the future. If long service awards are offered alongside short term goals and attainment rewards then employees are regularly reminded of how their efforts would be received, which breeds engagement and reinforces the message that this is a company worth working for. These employees should be able to impartially identify the employees worth rewarding and recognizing. Give the team a budget so that they can select appropriate gifts. The service award must contain a component that lasts over time such as a plaque or an additional acknowledgment of appreciation that the employee can treasure for years. It helps to present the award at an all-employee meeting or ceremony to enhance and publicize the value of the recognition. This recognition letter should state the length of service, thank the employee, and provide memorable details about why the employee is receiving the award. 'Choice motivates.' This has always been Engrave's mantra. We offer a unique and wide range of awards for our customers to choose from, focusing primarily on offering personalised options, that are in tune with the organisation's brand and work culture, along with the employees' achievements. Are these what you are looking for? OR Would you want them crafted to suit your needs?